Fresh, ripe figs are full of flavor and as tender as the day is long, and thus require very little gussying up. Try these ten quick and easy "recipes"— some sweet for dessert and some savory for appetizers — to make the most of ​fresh figs when they're in season. Wrap each fig with a piece of bacon (it works nicely to use a slice of bacon halved lengthwise and wrap it around the fig in a spiral - pancetta works nicely here too as long as it is very thinly sliced). Place figs on baking sheets and broil, turning as needed, until bacon is crisped and browned. Serve hot. Make a slit in the side of each fig. Stuff a bit of your favorite blue cheese into the fig - softer, creamier blues like gorgonzola dolce work best. 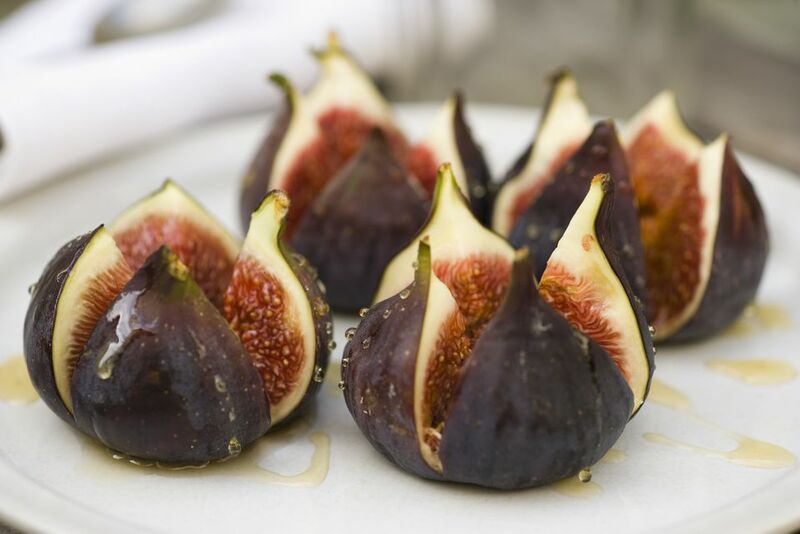 Serve as-is, or brush figs with canola or vegetable oil and set in a hot pan or on a hot grill, turning once, cooking until the figs are hot and cheese is melted, about 8 minutes total. Lay halved figs on a baking sheet. Brush with a bit of canola or vegetable oil or melted butter. Broil until the fig tops bubble and start to brown on the edges. Serve with sweet or savory dishes. For a super-simple dessert, drizzle figs with honey before broiling and serve with marscapone, creme fraiche, or ice cream. Add chopped figs and chopped, cooked pancetta or bacon to a simple tossed green salad. A simple balsamic vinegar dressing is a good match—3 tablespoons olive oil whisked with 1 tablespoon balsamic vinegar, salt and pepper added to taste. Make a spiced sugar syrup using 1 part sugar to 2 parts water; add a cinnamon stick, orange zest, a vanilla bean, whole cloves, star anise, or cardamom - even black peppercorns can work here. Bring to a boil to dissolve all the sugar. Reduce heat to maintain a steady simmer. Add whole or halved figs and cook about 5 minutes. Remove figs, let the syrup cool, and return figs to syrup (if you'd like the figs to breakdown a bit and become one with the syrup, leave them in while the mixture cools). 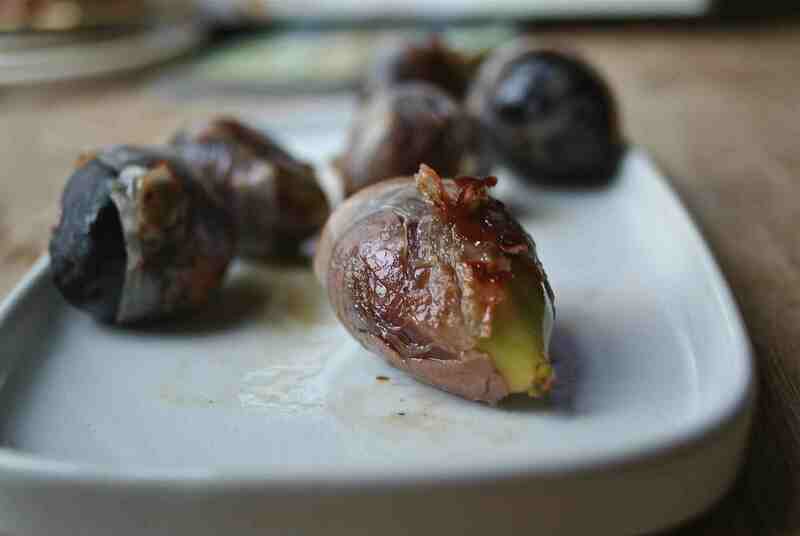 Serve in their own, but these figs are amazing with ice cream. They'll keep for several weeks in the fridge. In a blender or food processor, whirl figs with a splash of balsamic or sherry vinegar and enough olive oil to make the puree pourable. Add salt and freshly ground black pepper to taste. Heat gently and serve with pork, chicken, duck, or turkey. You can leave it fairly thick and use more as a spread. Finely chop figs and toss with a drizzle of balsamic vinegar and salt to taste. Let the figs sit while you cut baguette slices and toast them. Top the toasts with the fig mixture and a grind or two of freshly ground black pepper. You can spread a bit of fresh goat cheese on the toasts first, if you like, or crumble some blue cheese on top if that sounds tasty. Halve figs lengthwise. Melt a tablespoon or two each of butter and honey in a small frying pan and put the figs, cut-side down, in the pan. Cook until everything is bubbling and the figs start to brown a bit. As they cook, spoon the melted butter and honey over the top of the figs once or twice. Remove the figs from the pan and serve with cream, whipped cream, yogurt, or ice cream on the side, if you like. Halve or quarter figs lengthwise and serve with small dollops of marscapone, crème fraîche, Greek yogurt, or sour cream on top or to the side. A chiffonade of mint or bit of lemon zest is a nice touch. Cut figs in half or into wedges. Set on a plate with shavings of Parmesan cheese and drizzle with high-quality balsamic vinegar or fruit vinegar. A few twists of freshly ground black pepper are nice, too. A small dollop or two of fresh, creamy goat cheese (a.k.a. chevre) and some toasted pine nuts make for a rich, savory treat when plopped on sweet ripe figs. Sweet figs are a natural with fresh, ripe berries. Use them alongside berries wherever strikes your fancy: on yogurt, with granola, in smoothie bowls.... The possibilities are endless. Whether chopped and sprinkled over a sundae or cut into quarters and set in a bowl, figs and ice cream are a naturally sweet combination. Sweet figs and tangy yogurt are a deliciously nutritious combination. Go big with protein-packed, extra thick Greek yogurt—it stands up beautifully to the richness of figs. Figs bring a wonderful sweet note to any antipasto platter, providing a counter note to the salty meats and creamy cheeses. Serve them whole, halved, or quartered depending on their size and how many of them you have!